Runners fall into two camps: those who try to run unencumbered, and those who insiat on carrying half their earthly possessions and at least one water bottle. The latter will soon learn the annoyance of trying to carry a water bottle in your hand, while your phone rattles about in your pocket, as you attempt to keep the pace. Enter, the best running belts. No, they're not just to keep your shorts up. They're more like bum bags or, as Americans say, 'fanny packs' <-- In the UK, this is amusing. There’s no strict rules when it comes to choosing the best belt for running; you just need to make sure you purchase one that stays put as you run so you don’t experience unpleasant chafing. After that, it’s down the the amount of space and the number of pockets you need. The Flipbelt earns our top spot thanks to its soft spandex/lycra blend, internal pocket system and huge array of colours. If you're looking for a running belt that is more streamlined and ergonomic, take a look at the Nike Lean Waist Pack. A colourful, comfortable running belt, the much-loved FlipBelt is perfect for carrying phones, keys and credit cards. If comfort is at the top of your priority list, the spandex/lycra combination of the Flipbelt promises chafe-free exercise, while the internal pocket system handily fits phones, cards and keys. Thanks to its snug but (not overly tight) design, Flipbelts won’t wobble or bounce. You won’t be disappointed, even if you love colour – as well as the basic black shown here there are no fewer than 11 other colour options. Made from 100% nylon, this durable waist pack can be adjusted so it remains in place, and with its adjustable strap, this durable waist pack is ideal for runners looking to take their phone and keys out with them. 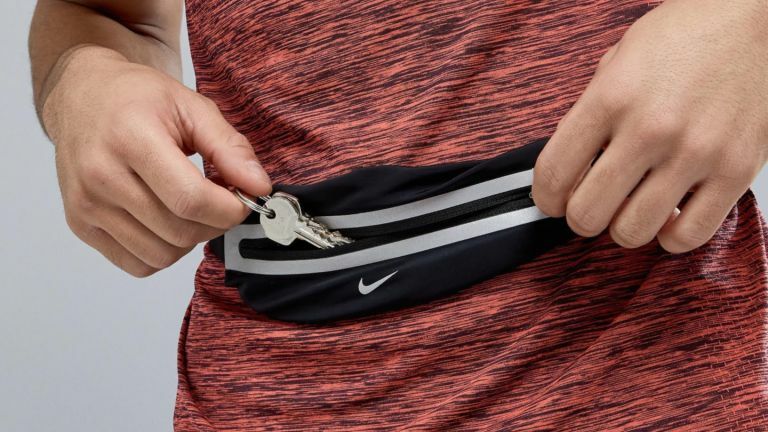 It’s heavier than the Flipbelt but it features a zipped, external pocket which may be more reassuring for some runners and also allows easier access to your stuff. Thanks to its buckle closure, this running belt is easier to take off than the Flipbelt and it features fluorescent strips on the outside, great for those who run in the evening. Combining the stretchiness of our first pick with the secure pockets of our second, the Spibelt is a great option for more serious excursions. Even London marathon runners have commended how ‘weightless’ this running belt feels when 25 miles in, and with its six running gel slots, this is the perfect running belt for long distance runs. Whether you’re tackling a marathon or a cross country race, your nutrition is within easy reach, while your phone, keys and cards can sit safely in the zip pocket. If you’re worried about your keys scratching your phone when they’re in the same pocket, your problems are solved with this large capacity running belt. Featuring a large and small pocket, there’s space for all of your necessary items. The belt is weather and sweat resistant, so it should remain comfortable to wear, no matter the conditions, while the reflective detailing keeps you safe on the road at night. Ideal for racing and training in all conditions. Setting you back around £10, if you’re looking for value, this running belt is a clear winner. Using the clasp you can adjust the belt to your waist size and easily take it on and off. There’s two pockets to fit all of your belongings, with a large pouch big enough to fit the latest iPhone. The material is soft and breathable, with the fit designed to be snug to minimise bouncing. With its handy headphone hole and two pocket design, this running belt offers great VFM. Although much bulkier and even less cool looking than all of the other belts on our list, this is the only one that is designed to carry water bottles. Two of 'em are included. With its enlarged pouch, it’s also capacious enough to fit plus-sized phones, and for those who fear death by lack of hydration will be glad of the duo of water bottles. Considering the bulk, the belt fits well enough to minimise bounce, and the bottle holders are designed for "easy, one handed operation".